The Mandolins are made in different wood combinations that come to different aesthetics and acoustic results. Wooden bridge with bone saddle, hand aplied natural shellac, string lenght of 350 mm and a 12 fret neck are standard. Tradicional 8 string tuned E,A,D,G and the ten string instrument with an extra bass pair in "C". 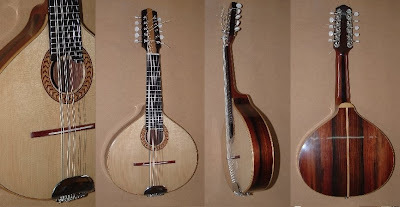 A new instrument was created searching better results for the ten string mandolin.With longer scale (400 mm) and lower tuning: D for firsth pair, G for second, C for third, F for forth and Bb for fifth. Using a normal string set and two .056W nylon string for fifth pair. A bigger string lenght and a larger sounding box provide a more appropriated bass resonance.